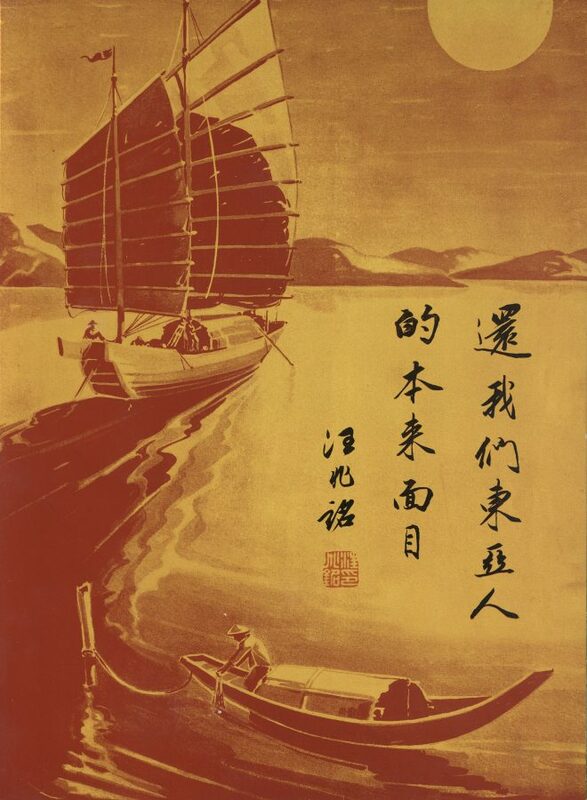 An unattributed image of sailboats on a river at dawn, superimposed with a line of pan-Asian-themed calligraphy by Wang Jingwei. This unattributed print was produced in a special 1941 booklet commemorating Wang Jingwei’s visit to Japan in June of that year. The phrase “Huan wo Dong Ya ren benlai de mianmu” (Restore to we East Asians our original countenance) is a deliberate play on the expression “Huan wo heshan” (Return to us the rivers and mountains). The latter was probably the single most commonly used phrase in the wartime propaganda of the resistance. 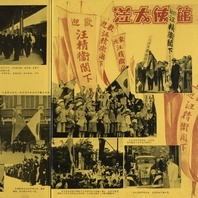 The print is taken from Huang Qingshu (ed), Wang zhuxi fang Ri jinian huakan (Special pictorial in commemoration of Chairman Wang’s visit to Japan) (Nanjing: Xuanchuanbu, 1941).